Scientists from James Cook University have discovered two critically endangered species of sea snakes they thought were extinct. They were basically hiding in plain sight on Ashmore Reef in the Timor Sea, they just hadn't been since in over 15 years. A Western Australia Parks and Wildlife Officer, Grant Griffin, sent a photo of the snakes in for identification. "We were blown away, these potentially extinct snakes were there in plain sight, living on one of Australia's natural icons, Ningaloo Reef," says lead author Blanche D'Anastasi from the ARC Centre of Excellence for Coral Reef Studies at JCU. "What is even more exciting is that they were courting, suggesting that they are members of a breeding population." The researchers also made another unexpected discovery, uncovering a significant population of the rare leaf scaled sea snake in the lush seagrass beds of Shark Bay. The discovery was made 1700 kilometers south of the snakes only known habitat on Ashmore Reef. 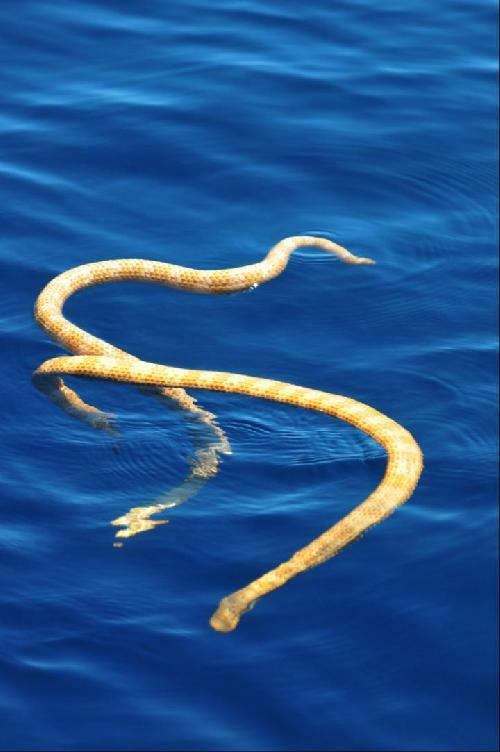 "We had thought that this species of sea snake was only found on tropical coral reefs. Finding them in seagrass beds at Shark Bay was a real surprise," says D'Anastasi. Both leaf scaled and short nosed sea snakes are listed as Critically Endangered under Australia's threatened species legislation, which means they have special protection.